"Autumn Eyes" & "Bear Thoughts"
Thank you to Mike & Natalie, the wonderful owners of my Original "Autumn Eyes" Painting! I was fortunate to meet them at Park City Fine Art in Park City, UT during my Gallery Show at the 2015 Sundance Film Festival! In Teshia's striking new painting, "Autumn Eyes", we take a walk with a curious Black Bear as he meanders through a foggy forest of golden, snow-sprinkled Aspen trees on a crisp & cool early Autumn morning. 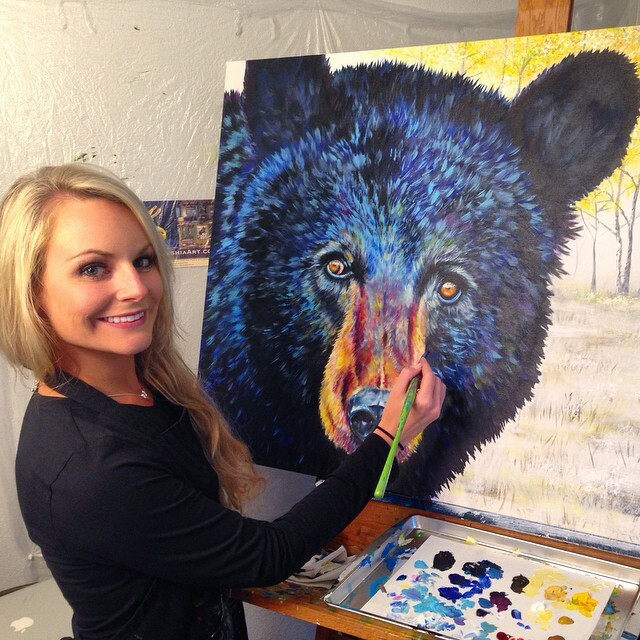 Teshia believes that eyes are the windows to the soul, & she typically emphasizes a thought-provoking state of emotion in the eyes of the animals that she paints. Her goal is to express the souls of the animals through their mesmerizing stares, & to embody their thoughts in order to create a "conversation" with the viewer. She is a master at bringing life into her creations, while also infusing them with her signature-vibrant colors & vivid energy. She hopes that you feel magnetized to her painting subjects, just as you would if you were to come face to face with the wild characters that she creates in nature. When viewing "Autumn Eyes", Teshia hopes that you will feel a bit more connected to this handsome, curious black bear, to the wildlife around you, to nature, to our beautiful planet.... & to all of the curious & colorful souls that call it home. She hopes that you will take a moment to delve a bit more deeply into this piece, & to truly see what it is that lies within this inquisitive Black Bear's..... Autumn Eyes. ©2009-2019 TeshiaArt. All Rights Reserved.